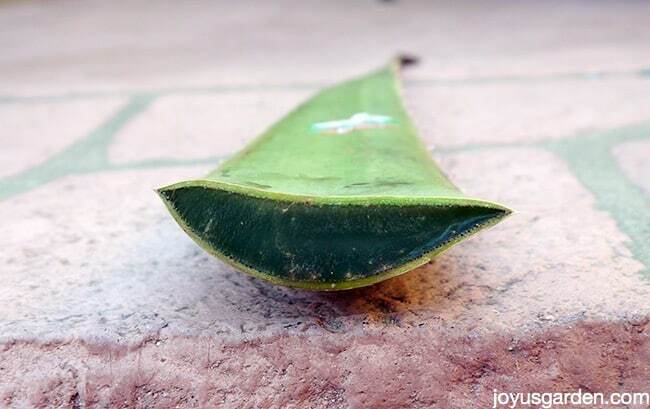 Aloe vera is a plant with purpose. Here's what you need to know to grow this commonly sold, easy succulent as a houseplant & in the garden. I would hazard a guess to say that Aloe Vera is the most widely sold succulent the world over. Yes it’s true, this plant has been used for 1000’s of years and is still favored today. 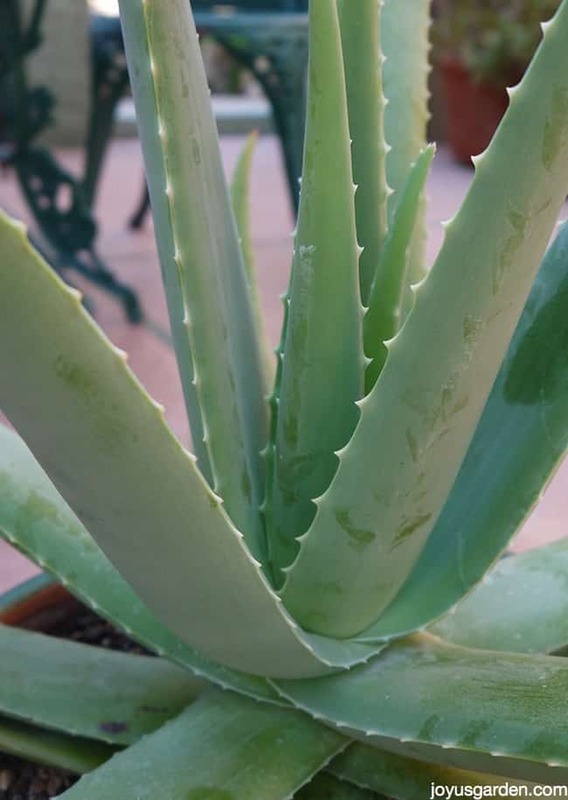 You find it in many homes and gardens and it also goes by many other names as well – Aloe barbadensis, First Aid Plant, True Aloe, African Aloe, Burn Plant and Miracle Plant, to mention a few. This beneficial plant with purpose is really easy to grow in your home and in the garden so stay tuned because there are care tips coming your way. 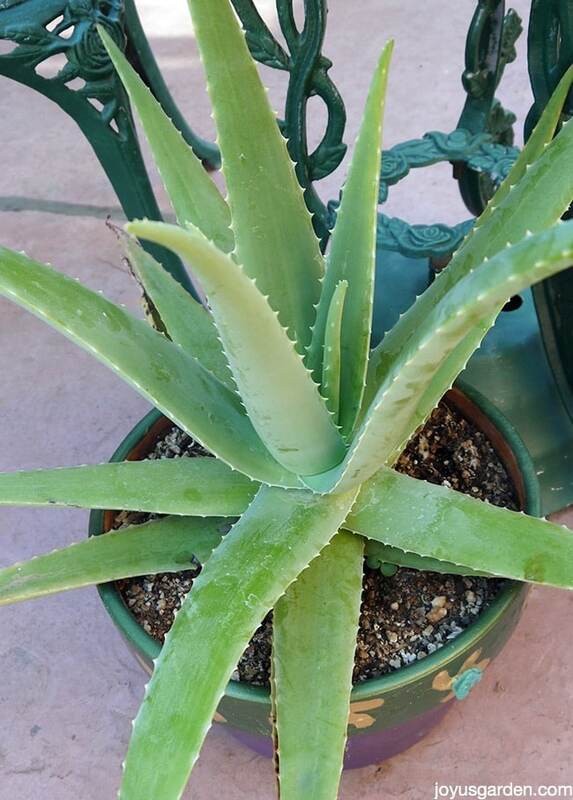 As you can see, Aloe vera grows in a rosette form as it ages. It does wonderfully in containers & I think it’s especially suited to terra cotta – it’s a great look. My Aloe veras grow in pots year round outdoors and I hardly do a thing to them in terms of care. They also make fine houseplants (so fine that it’s included in my houseplant care book) and are particularly handy to have growing in the kitchen. If you burn yourself that soothing fresh gel contained in the leaves is right there waiting for you. Head’s up because there are 2 important things you need to know to grow them successfully in your home. Hint, hint: they’re listed under the 1st 2 care tips. 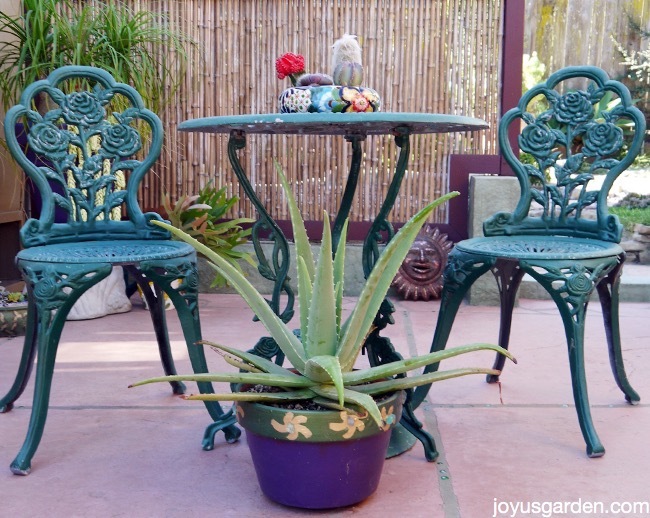 In the garden, you want your Aloe vera to get 2 or 3 hours of sun a day. As a general rule, along the coast it can take more sun than hot inland areas. It’s best protected from the hot afternoon sun & mine was actually stressed from being in too much sun (plus it desperately need repotting). Now it lives on the back patio where it gets lots of light but little direct sun. Indoors, it needs as much light as possible, like a south of west exposure. This is not a low light plant & if it’s not getting the light it needs, the leaves will droop downwards. Just be sure to keep it away from hot glass (like a west exposure) because it’ll burn. It can be near that window but not in it. 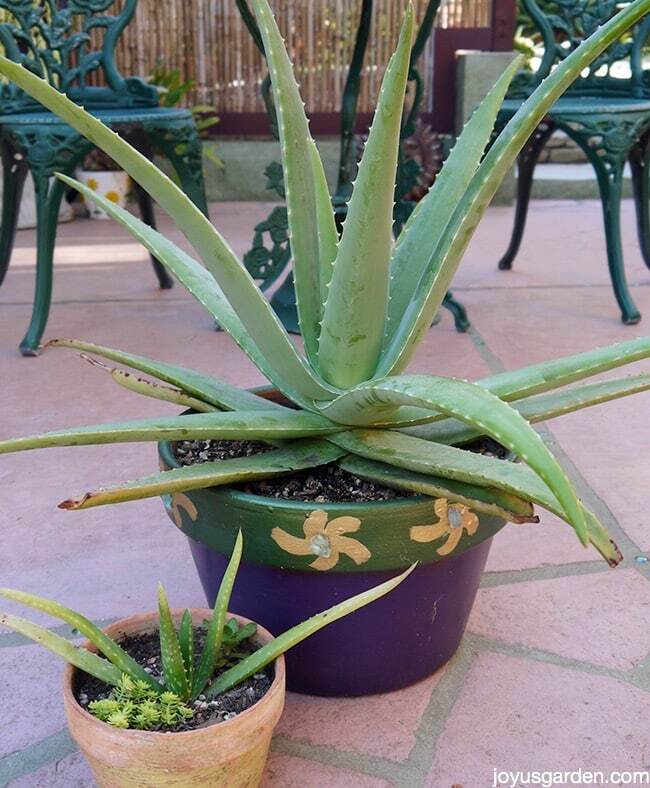 No matter where you have it growing, you want your Aloe vera to almost completely dry out before watering it again. Water it thoroughly & make sure all that water drains out – you don’t want it to be sitting in any water. In the summer I water mine every 7-14 days, depending on the weather. Indoors, once a month should do it. In the winter, it might need it even less, maybe once every 2 months. Remember, those fleshy leaves & roots are full of water & they can easily rot out. Following hot on the heels of watering (or over watering! ), it’s very important to make sure that the mix you have your it planted in drains well. I always use succulent & cactus mix & recommend that you use it any time you’re planting Aloe vera in containers. The leaves of my Aloe vera have really greened & plumped up since I repotted it & moved it to a less sunny spot. Aloe vera is hardy to around 28 degrees F.
Like the majority of succulents, none is really necessary. I top dress mine with a 1″ layer of worm castings every spring. You can do the same indoors or use a balanced liquid houseplant food once in the spring. Either way, don’t over fertilize & never feed in the colder, darker months. Shhhh, the plant is resting! Propagating is done by division of the offsets, or those pups (babies) which appear at the base of the mother plant. Most succulents you can propagate by stem &/or leaf cuttings but not an Aloe vera. There are no stems & the leaves are way too full of gel. You see how I removed the baby in this video starting at the 1:40 mark. Here’s the offset that came off the mother plant. None is really needed except to prune off the spent flower stalks & of course to remove those fleshy, fabulous leaves. You can cut a leaf in 1 or 2″ intervals if you’d like because it won’t harm the plant at all. I always remove the whole leaf because I think it looks much better. I just wrap the leaf in tin foil & cut it as I need it. Sometimes that cool gel feels soooo good! Mine outdoors gets an occasional light infestation of orange aphids, usually at the end of summer/beginning of fall, which I just gently blast off with the hose. Indoors they can also be susceptible to mealy bugs & scale. You can wipe the mealy bug off with alcohol & a cotton swab. Scale can be removed the same way or you can scrape it off with your fingernail or a dull knife. The yellow flowers appear on stalks that rise up above the plant. Here in Santa Barbara they flower in late winter into spring. It is early March & mine has a flower which will be opening soon. This is a huge Aloe vera leaf I bought at the Mexican market near my house. All that wonderful gel! About 6 Decembers ago we had a 4 day cold (around 35 degrees…brrrrr) & rainy spell, not too common for us here in Santa Barbara. The succulents were saying: “what’s up with this?”. That in addition to the fact that my poor Aloe was getting too much direct sun in the summer had caused the leaves to turn pale & orangish. Here’s something you need to know: the leaves of the Aloe Vera will turn orange (or orange/brown) if they get sunburned or stressed. I’m sure that cold rain didn’t help either. Aloe doesn’t mind being a bit pot bound so you don’t need to repot it every year. As this plant grows & the leaves get big & full of gel, it gets quite heavy. You’ll need a substantial base – no little flimsy plastic pots here, please. Quick recap: if you’re growing this succulent indoors, just remember – high light, low water (hey, those roots need oxygen too). There are about 400 different species of aloes in the world and this one is definitely the most well known. How does it feel to be so fabulously famous Aloe vera??!! Love this, didn’t really know how to care for my aloe plant, but other then the sun I was doing things right. Will put this in a west window. Thank You. Thank you Nell, (my aloe thanks you too!) I’ve NOT been letting mine dry out in between waterings, so now I’ll have a happier plant! Otherwise here in metro Atlanta (Georgia) it does pretty good. If you take a leaf off of aloe plant can you put in water to rebooted, not sure to asking ,for a friend. I have an aloe that has grown extremely large. I would like to separate it as I think it has to be root bound, but I am unsure as to how to do this. Any tips?